Tigh na Mara in the Spring evening light. Loch Coruisk to the Cuillin ridge from the summit of Sgurr na Stri. There are often sightings of great skua, golden eagle and maybe a sea eagle in the area. Tigh na Mara is a comfortable and highly commended family owned croft house which has panoramic views from virtually all of it’s rooms. The stunning sunsets can be enjoyed from the comfort of the south facing sunroom across to Loch Dunvegan and the Islands of North and South Uist, and have been appreciated by many of its guests over many many years. 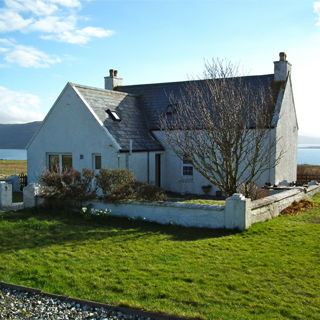 Living up to its Gaelic name, ‘Tigh na Mara’ (house by the sea) is situated in its own small croft. And as a family owned home, which was built as a croft house by the current owners late grandparents, Tigh na Mara affords a spacious, very comfortable base, for a family holiday or for a group of friends who simply wish for peace, quiet, and relaxation amongst some of the most stunning views of the West Highland Scottish coastline. Please take some time to read the other pages on our website, and phone either of us if you have any questions or queries.